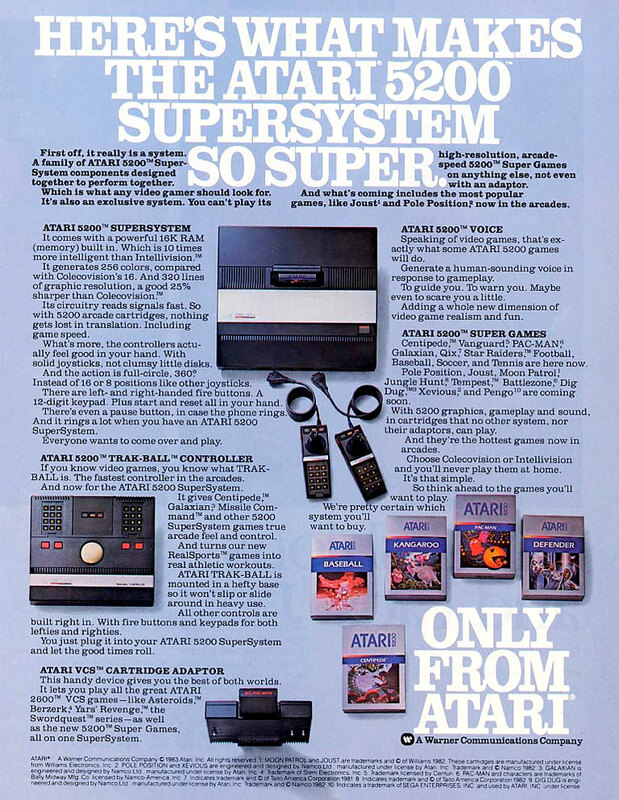 The images of the Atari 5200 SuperSystem are categorized and show the console, joystick controllers and several 3rd party accessories. You will also find detailed close-ups of the ports and connections available on the 5200. Atari 5200 SuperSystem - 4 Port: front view. 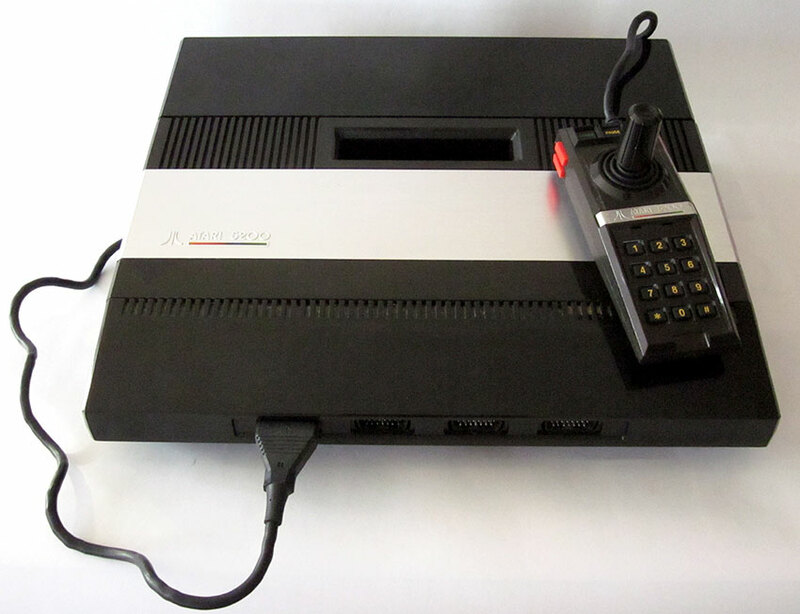 Released in 1982, the 5200 was created to compete with the Intellivision, but wound up competing with the ColecoVision shortly after its release. Atari 5200 SuperSystem - 4 Port: front view. 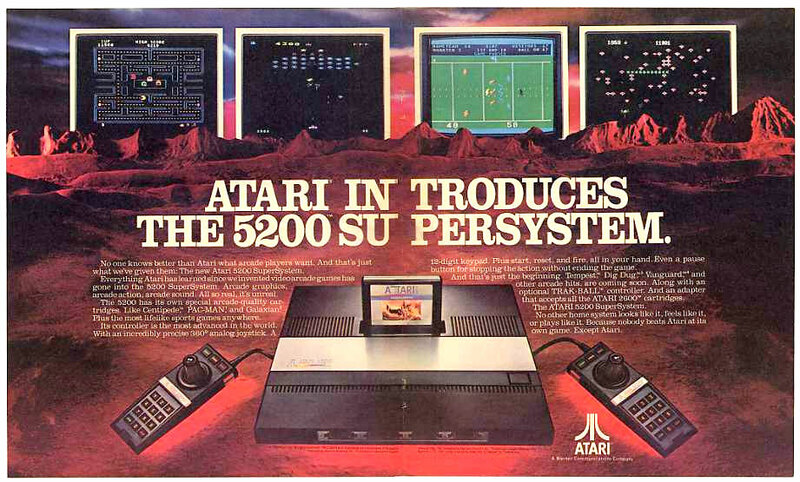 The 5200 was based on Atari's existing 400/800 computers and the internal hardware was almost identical, although software was not compatible. Atari 5200 SuperSystem - 4 Port: left side view. Much of the technology in the Atari 8-bit family of home computer systems were originally developed as a second-generation games console intended to replace the 2600. As the system was reaching completion, the personal computer revolution was blowing up with the release of the Commodore PET, TRS-80 and Apple II. These computers were similar in a technical manner to the 2600, but sold for much higher prices. Atari's management decided to enter this market, and the new technology was repackaged into the Atari 400 and 800, hitting the market in 1979. Atari 5200 SuperSystem - 4 Port: right side view. Although the 5200's internal design was based on the 400/800 computers, the differences were sufficient that games designed for one would not run on the other. One of the obvious differences was the 5200 had no keyboard. 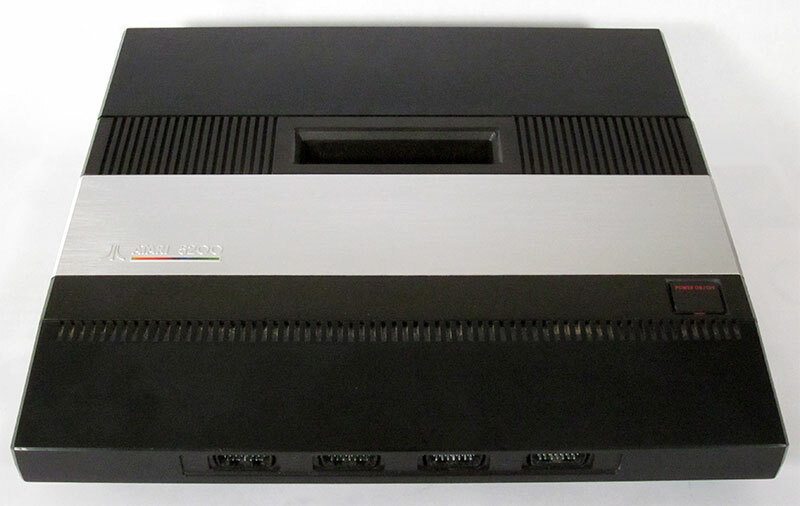 Atari 5200 SuperSystem - 4 Port: side view. 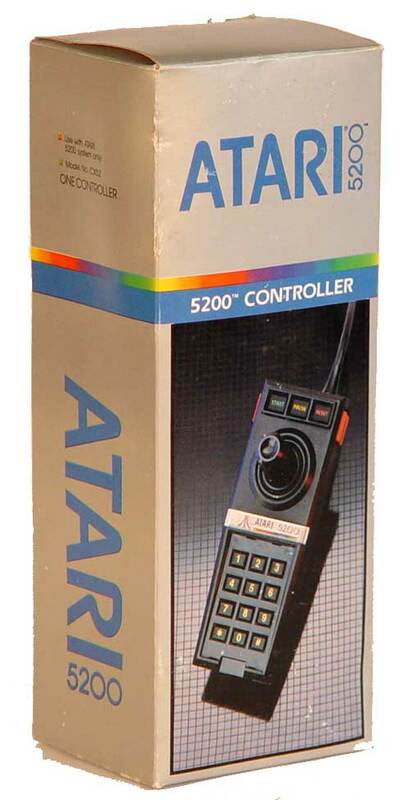 The 5200 did not fare well compared to the Atari 2600. 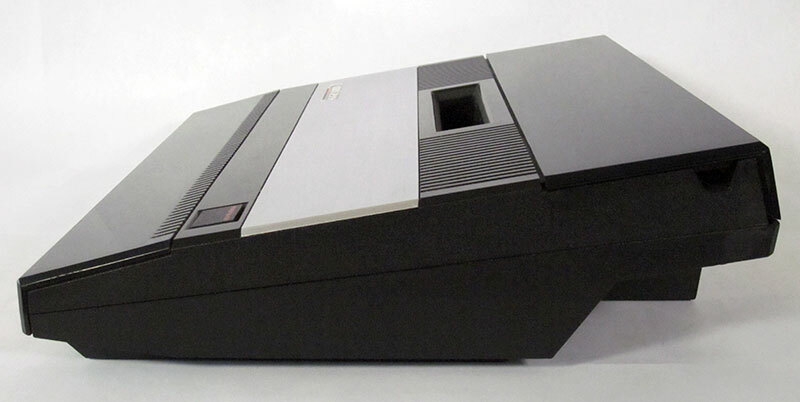 The 5200 had superior graphics to both the 2600 and Mattel's Intellivision, the system was initially incompatible with the 2600's large library of games. 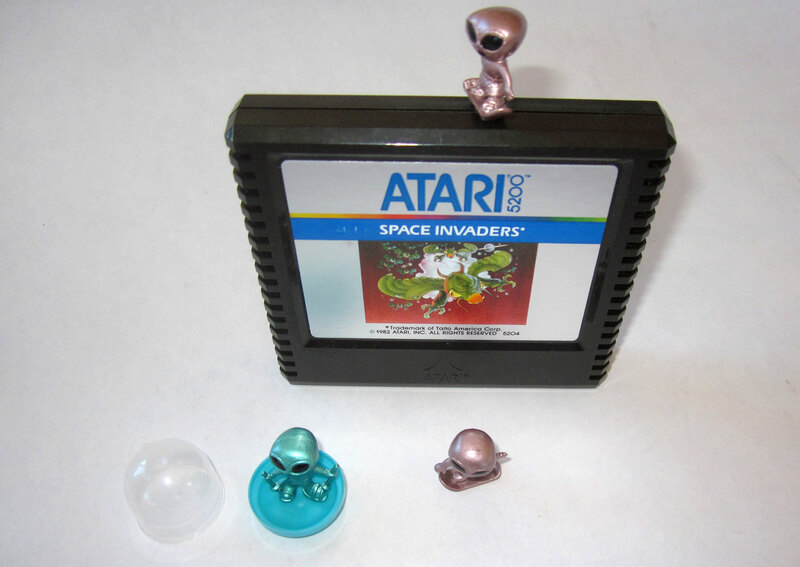 This hurt its sales especially since an Atari 2600 cartridge adapter for the Intellivision II had been released. Atari 5200 SuperSystem - 4 Port: front view showing the open cover where the joysticks are stored when not in use. 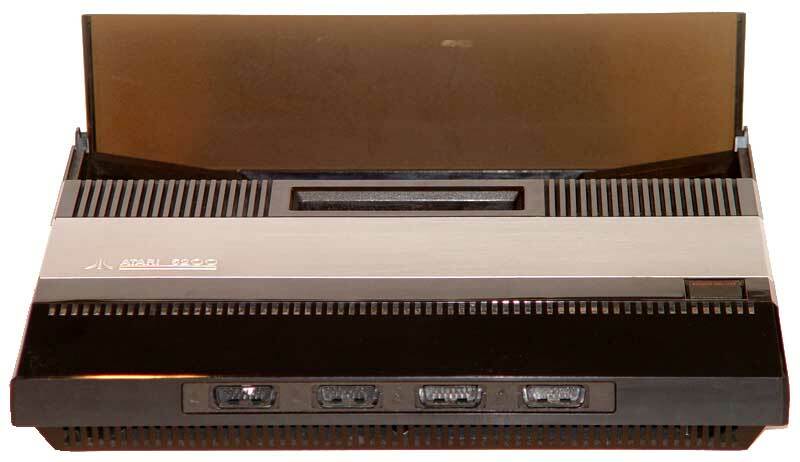 Atari 5200 SuperSystem - 4 Port: rear view. The pack-in game, Super Breakout, was criticized as too simplistic and not able to show off the technical prowess of the system. This gave the ColecoVision a significant advantage since its pack-in, Donkey Kong, delivered a more authentic arcade experience than any previous game cartridge. Atari 5200 SuperSystem - 4 Port with Centipede game cart inserted in the cartridge slot. Atari 5200 SuperSystem - 4 Port showing the built-in storage compartment for the controllers behind the cartridge slot. They never fit in there very well due to the cables. 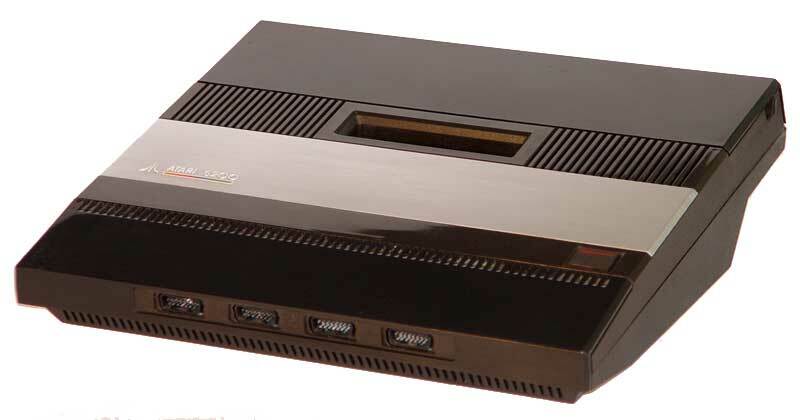 Atari had planned a smaller, inexpensive version of the Atari 5200, which would have removed the controller storage bin. 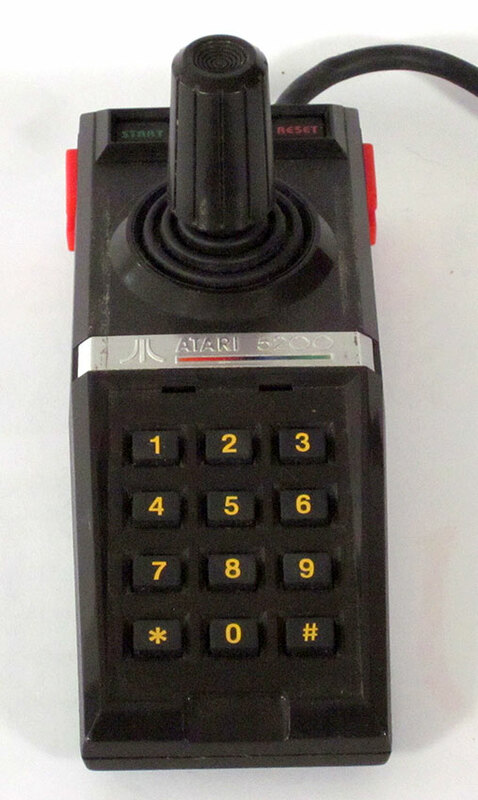 Code-named the "Atari 5100" (aka: Atari 5200 Jr.). Only a few fully working prototype 5100s were made before the project was canceled. Atari 5200 SuperSystem - 4 Port with 1 boxed controller. Atari 5200 SuperSystem - 4 Port with joystick controller. 69 games were officially released for the system making it quite easy to collect for. Super Breakout, Galaxian and Space Invaders were the system's launch titles. A port of Asteroids was advertised as a launch title, but was never released. Gremlins, released in 1986, was the last game officially released for the system. 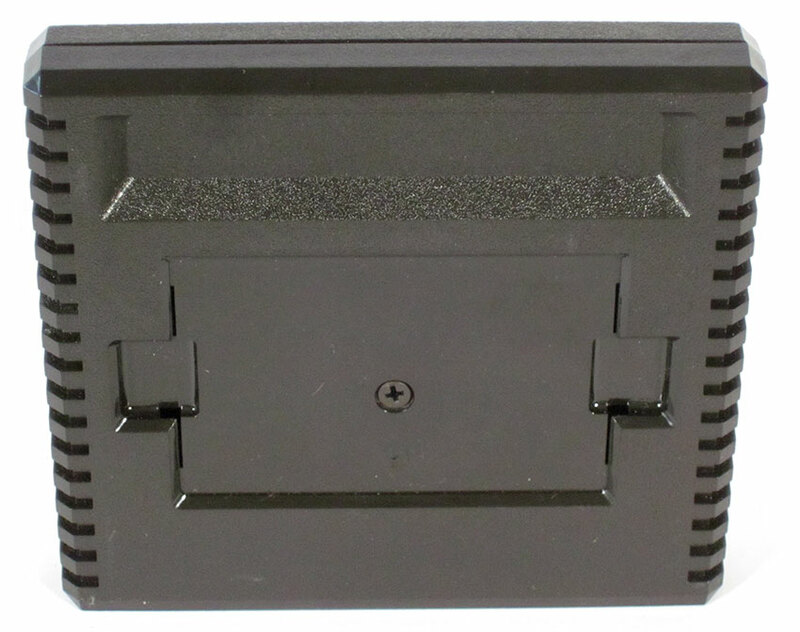 Atari 5200 SuperSystem: bottom view. 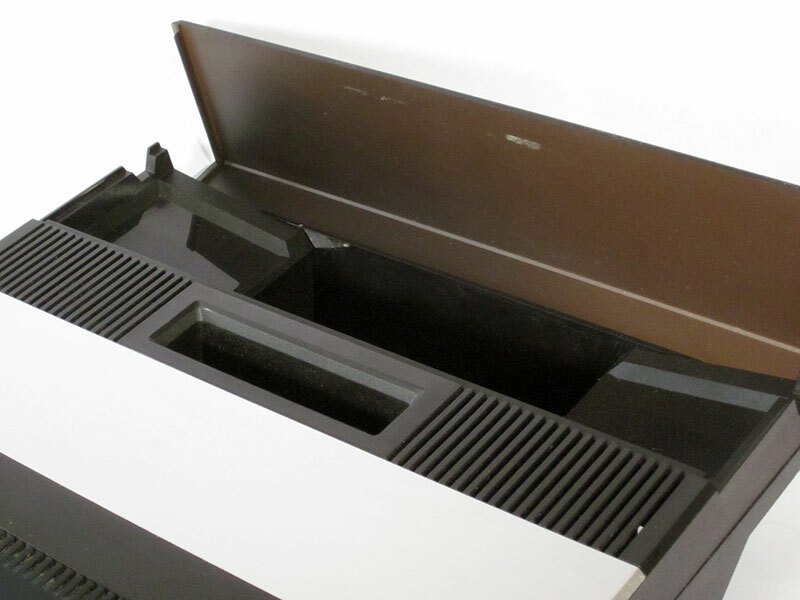 Atari 5200 SuperSystem: bottom view showing how the A/V cable coils into the bottom of the console for easy storage. 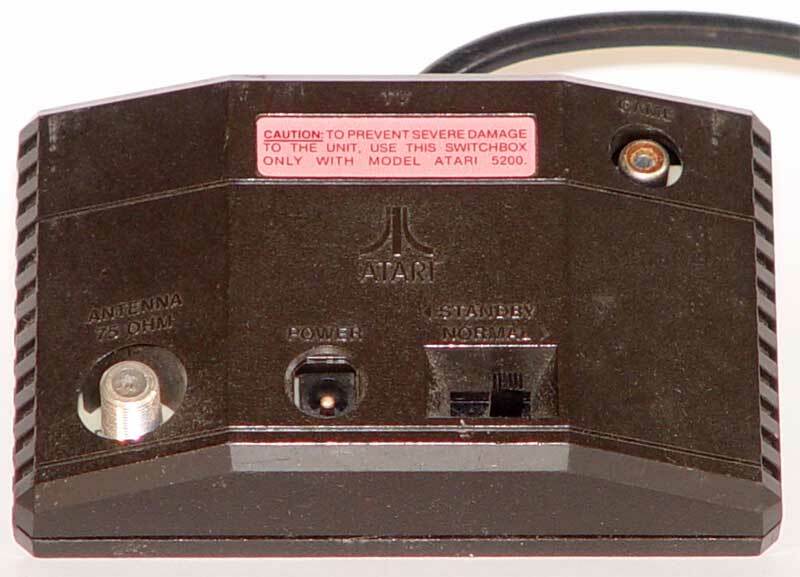 Atari 5200 SuperSystem: closeup of the four front-placed controller ports. 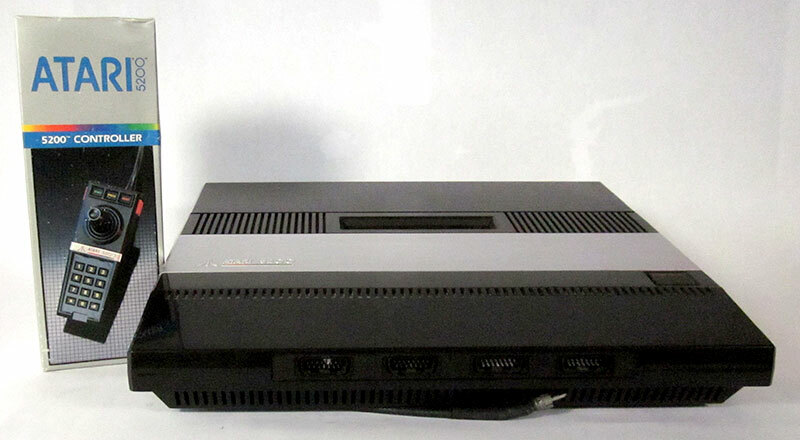 The initial 5200 featured 4 controller ports, While most other systems only had 2 ports.There were also 2 port versions of the 5200 Super System console. 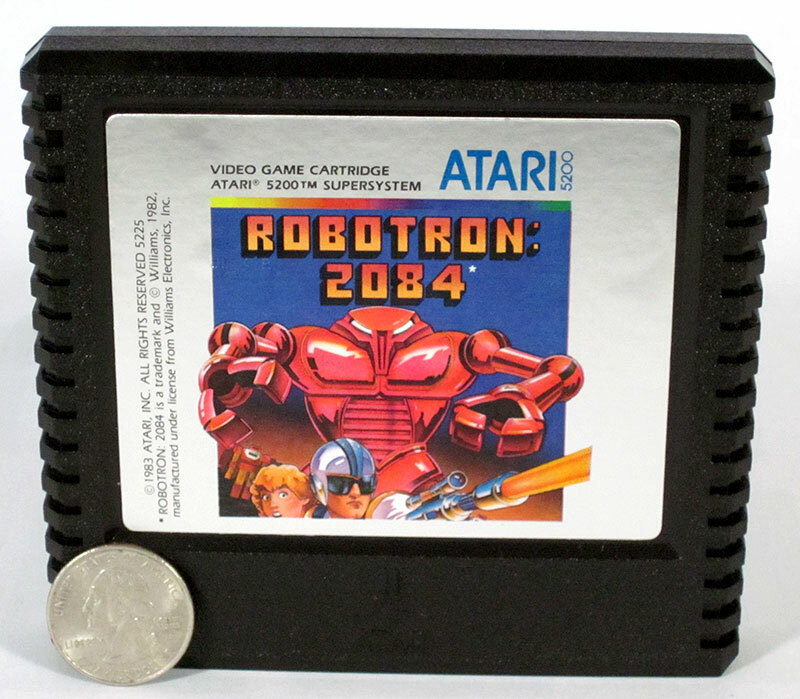 Atari 5200 Robotron game cartridge. 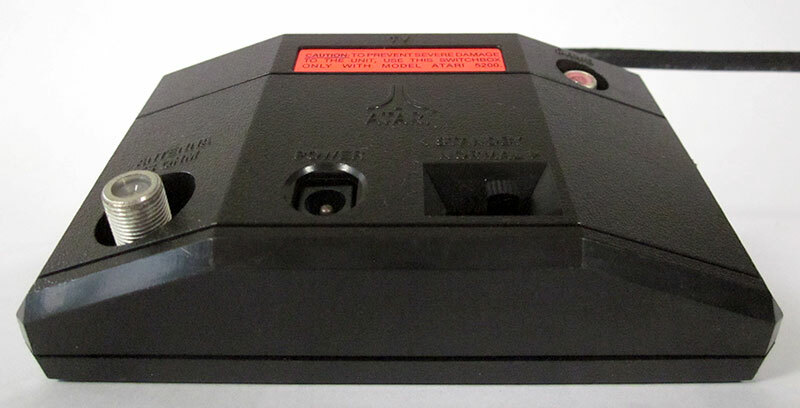 Atari 5200 game cartridge - rear view. Atari 5200 game cartridges from several manufacturers. 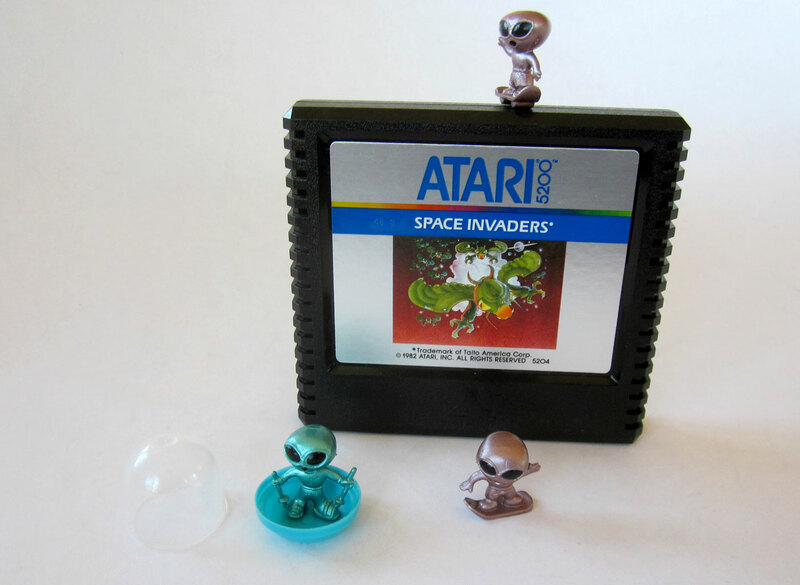 Space Invaders for the Atari 5200 . 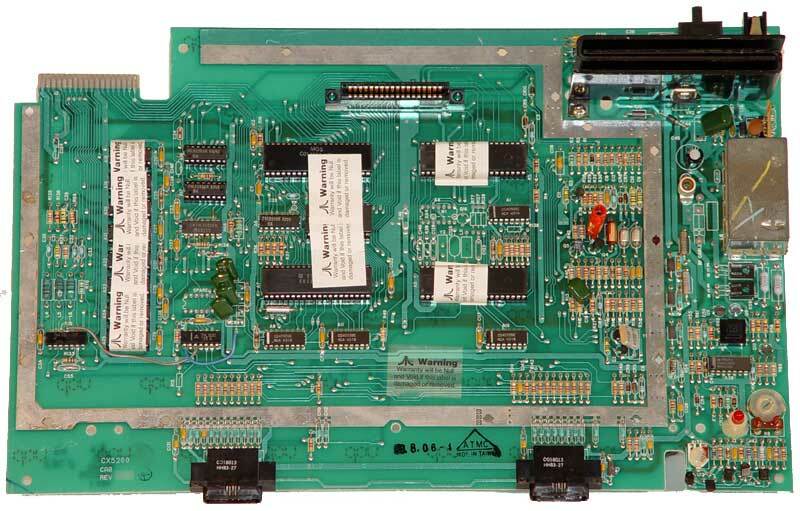 2-Port replacement board for the Atari 5200 SuperSystem. 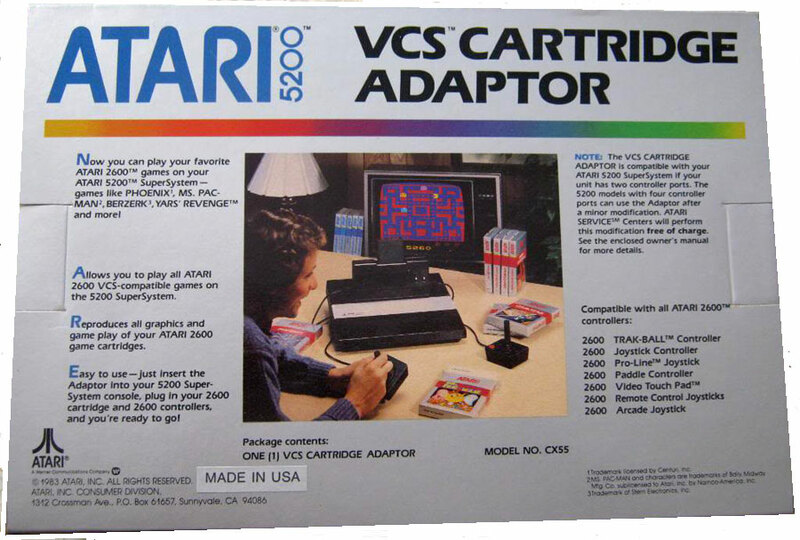 The 1983 revision of the Atari 5200 has changes in the cartridge port address lines to allow for the Atari 2600 adapter released that year. 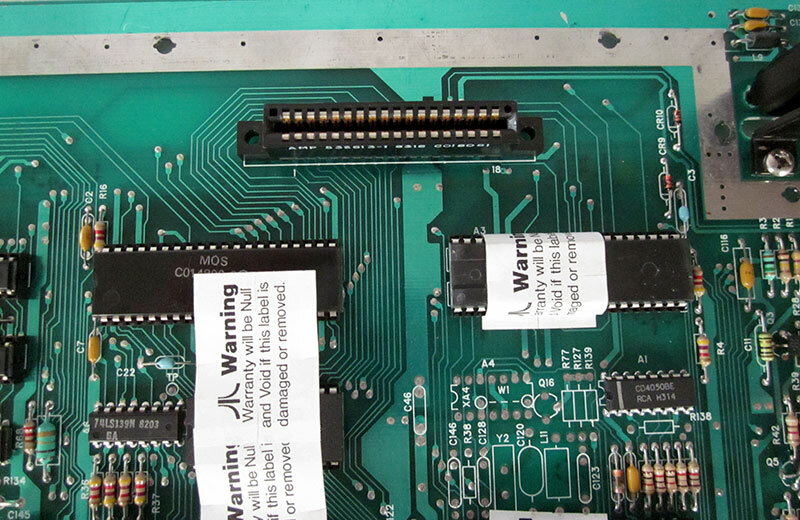 2-Port replacement board for the Atari 5200, laying flat. 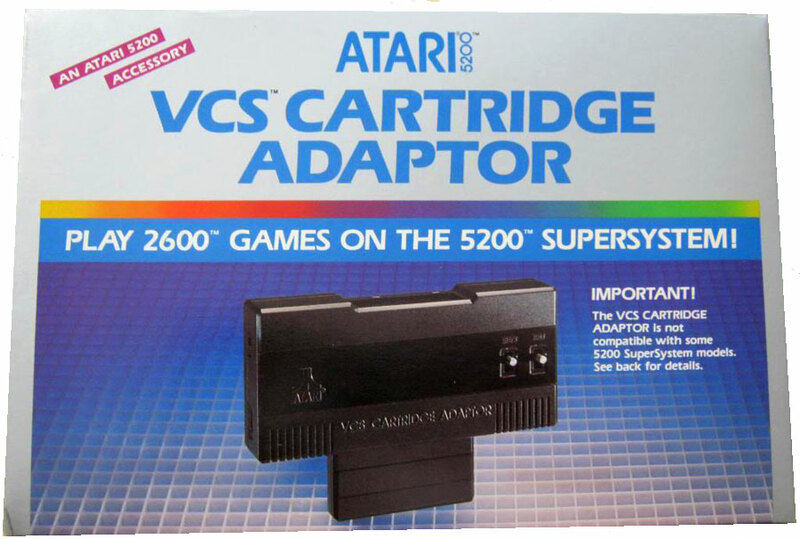 While the 2600 adapter was only made to work on the two-port version, modifications can be made to the four-port to make it line-compatible. 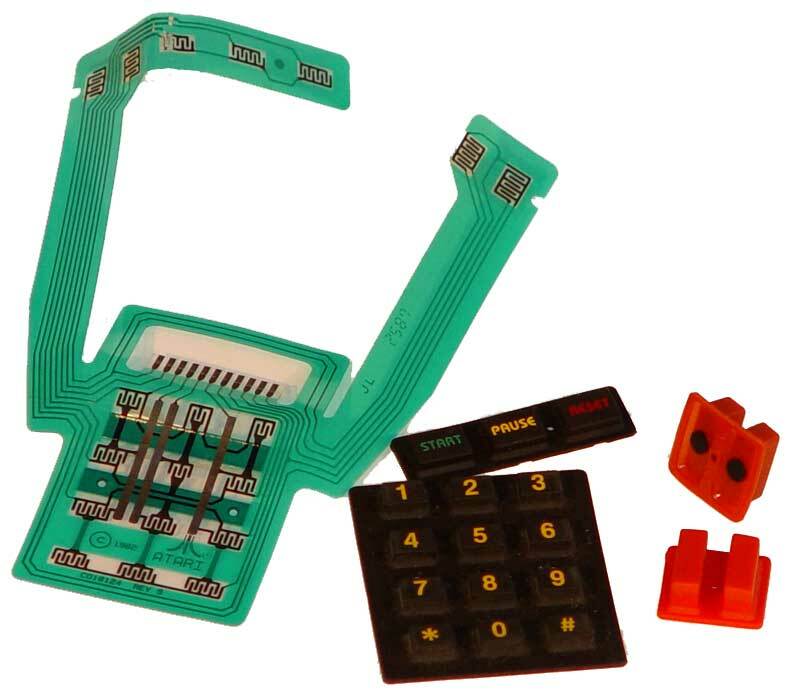 In fact, towards the end of the four-port model's production run, there were a limited number of consoles produced which included these modifications. These consoles can be identified by an asterisk in their serial number. 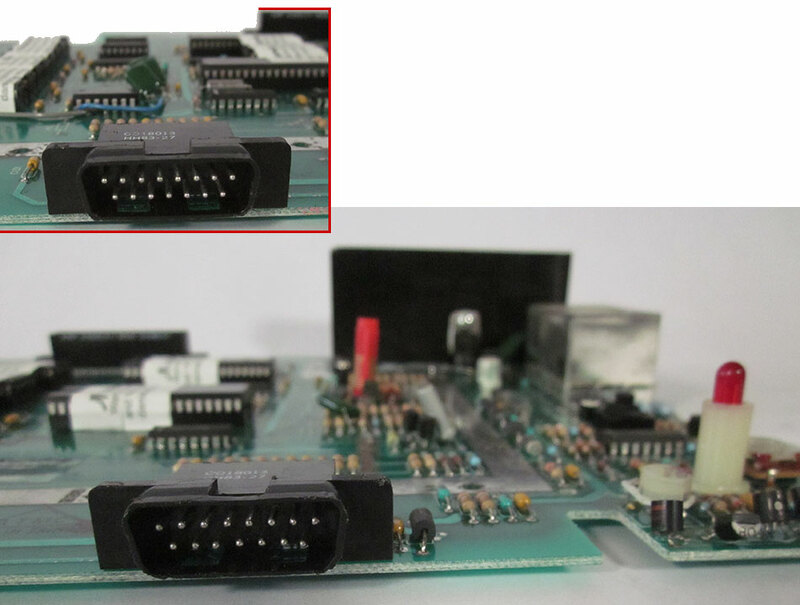 2-Port replacement board for the Atari 5200 SuperSystem, close up. PCB ports for the Atari 5200, close up. 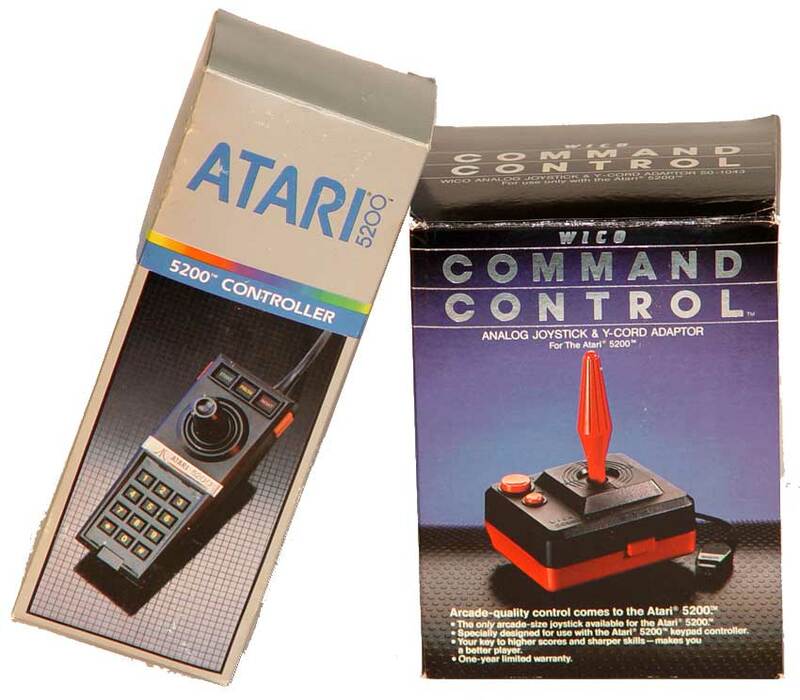 Atari 5200 controller box. The controllers have an analog joystick and a numeric keypad along with start, pause and reset buttons. 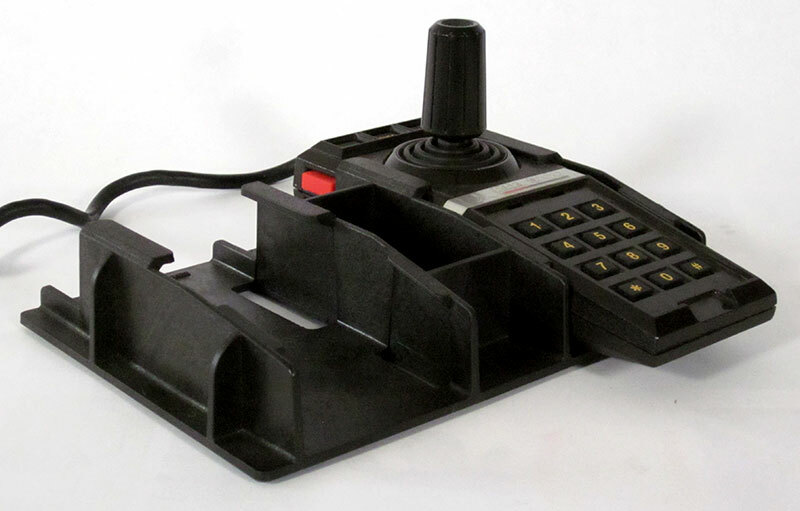 The 360-degree non-centering joystick was touted as offering more control than the eight-way joystick controller offered with the Atari 2600. 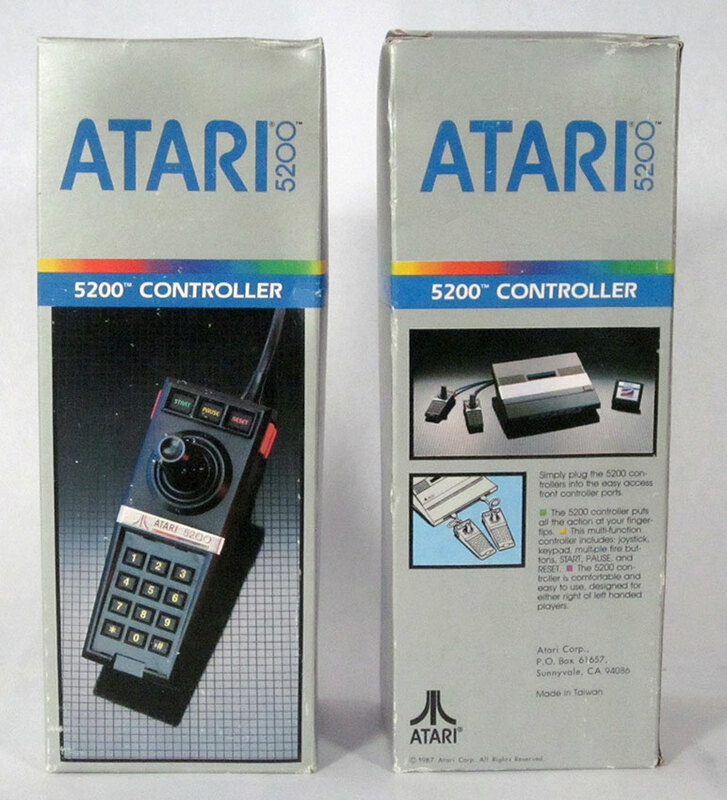 Atari 5200 controller boxes: front & rear. A major flaw of the controllers was the design didn't translate into a linear acceleration from the center through the arc of the stick travel. The controllers did, however, include a pause button, a unique feature at the time. 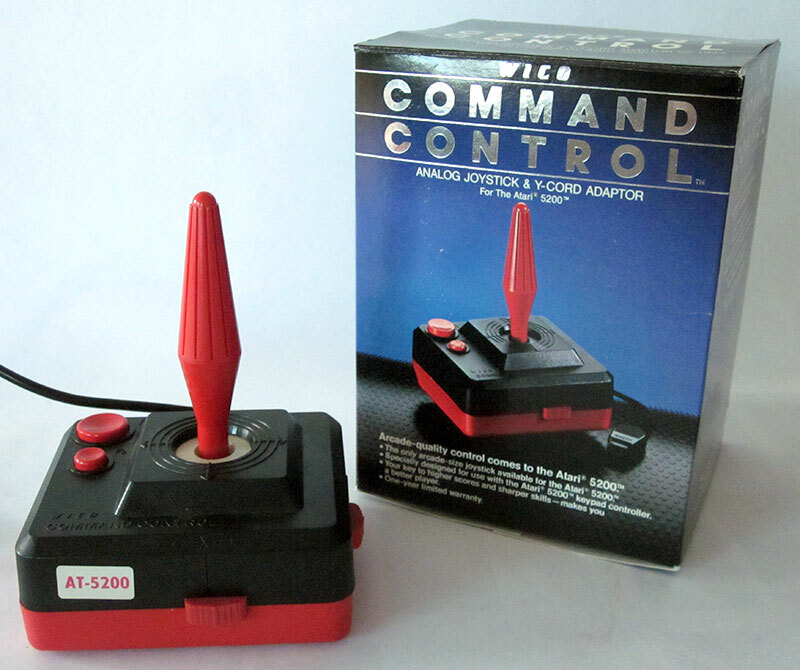 Various third party replacement joysticks were also released, including those made by Wico. 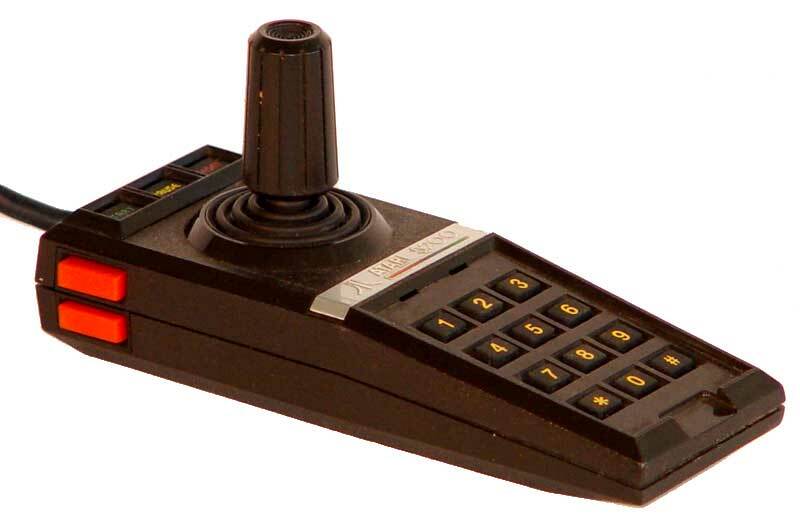 The Atari 5200 controller was their first controller with a potentiometer-based analog joystick. 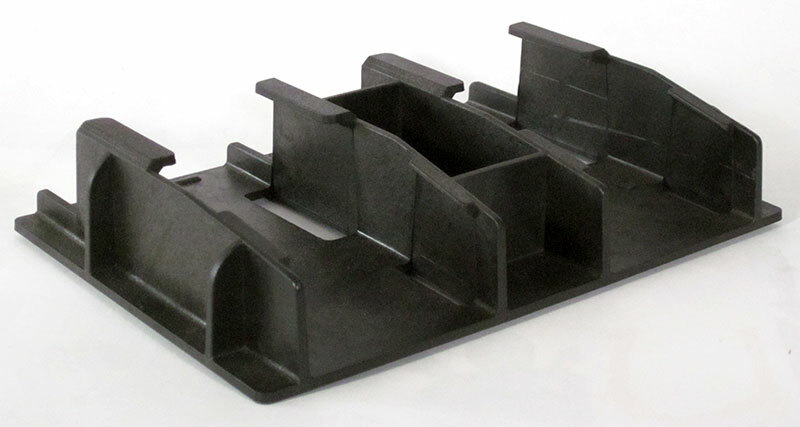 However, its non-centering joystick design proved to be ungainly and unreliable, aggravating many consumers. 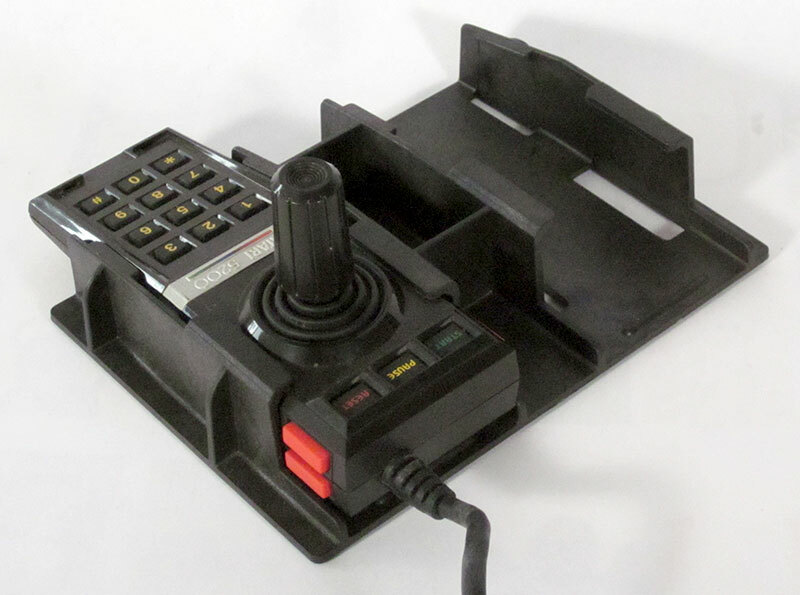 Atari 5200 controller: front view. Atari 5200 controller: top view. Atari 5200 controller: bottom view. 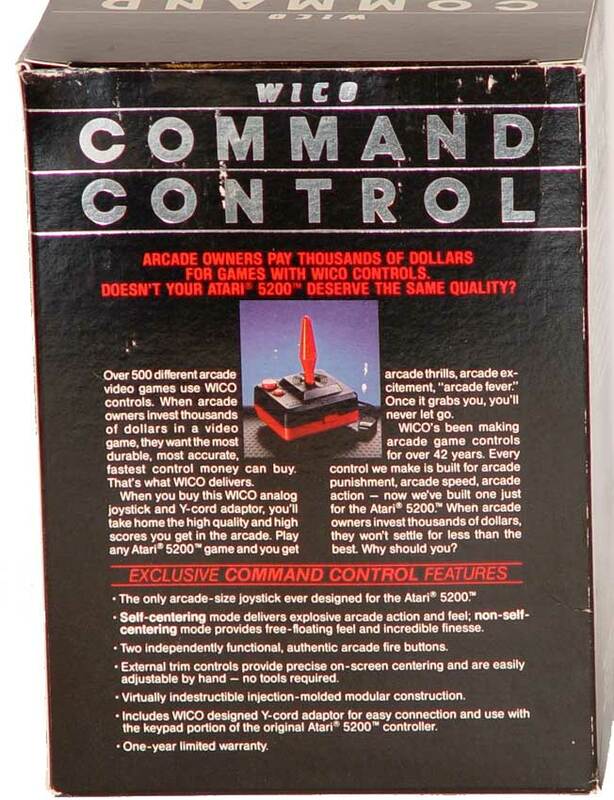 Atari 5200 WICO controller box. Atari 5200 WICO controller box 3/4 view. Atari 5200 WICO controller box: rear view. 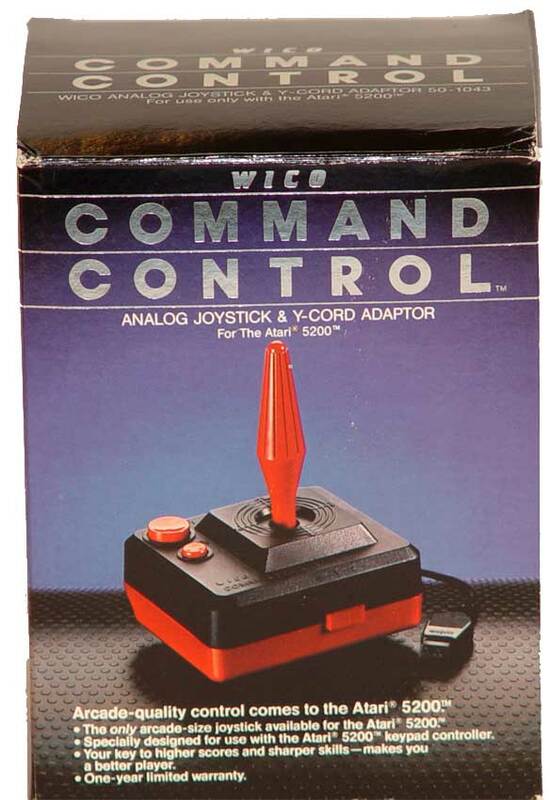 WICO controller box & Stick. 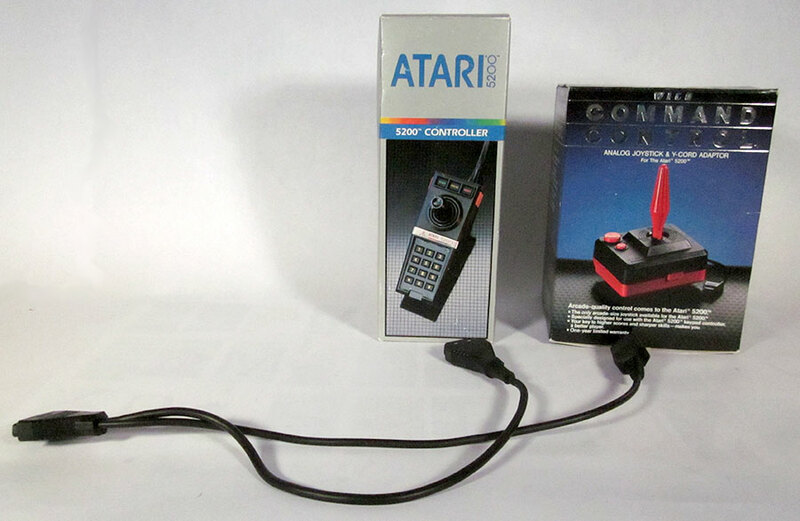 Atari 5200 & WICO joystick boxes. 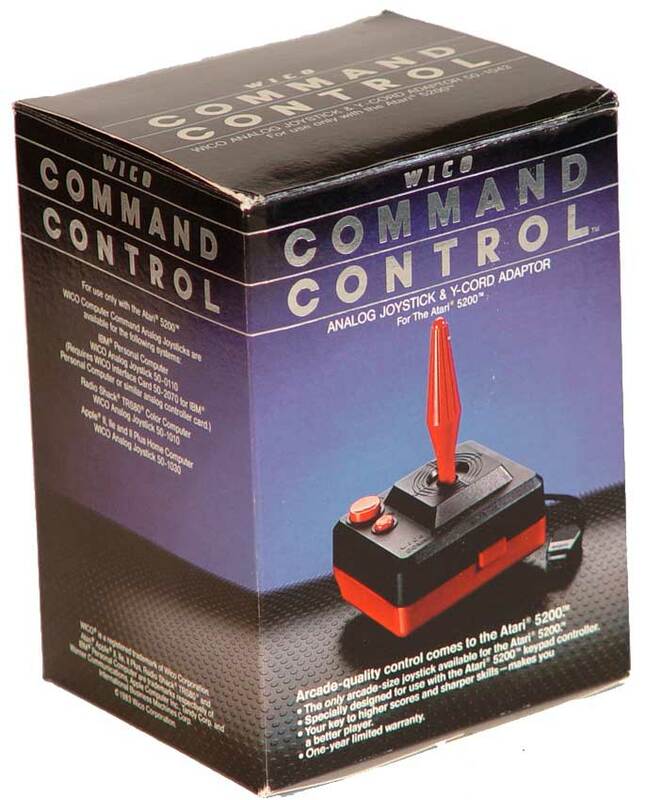 Wico controller for the Atari 5200. Wico controller for the Atari 5200 - top view. Wico controller for the Atari 5200 showing the 2 slide-switches that adjust the centering of the stick. 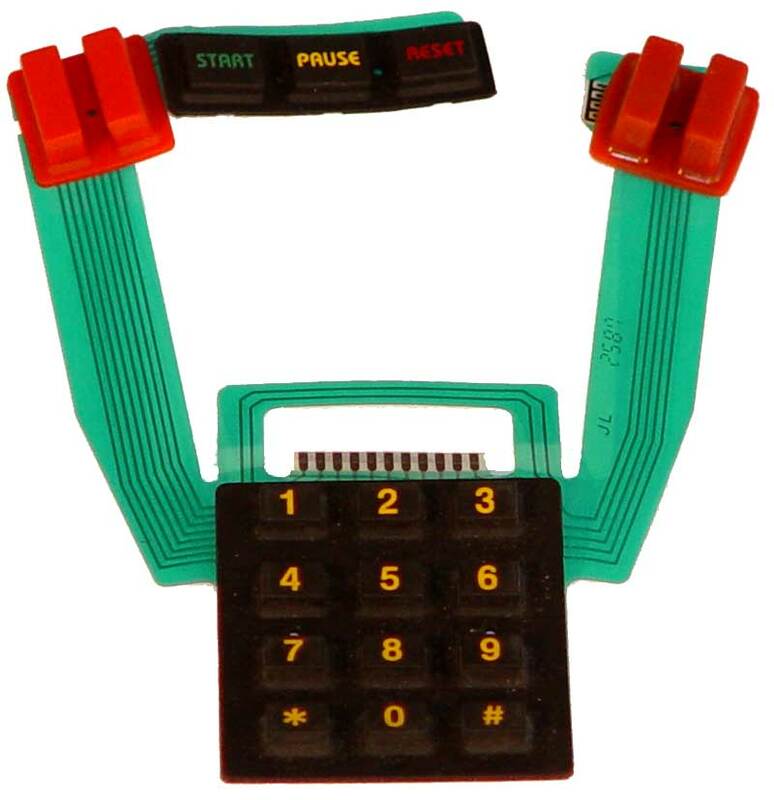 Wico controller for the Atari 5200 showing the center spring switches that allow the stick to snap to center or float freely. 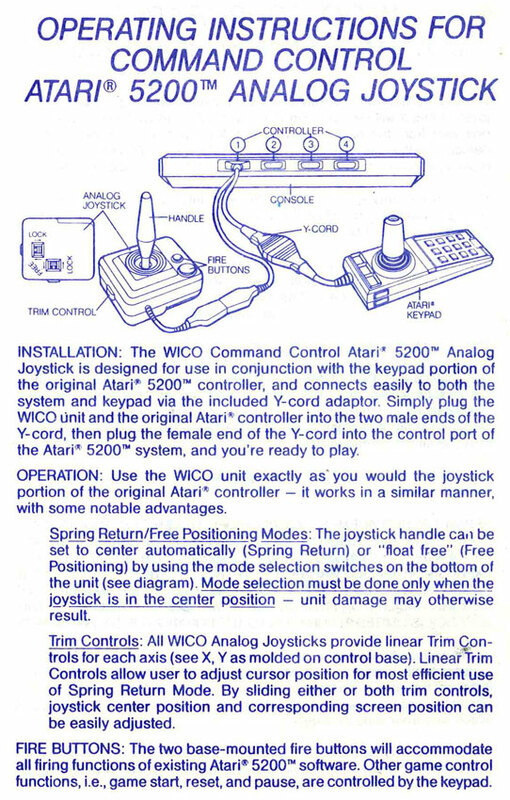 Wico controller for the Atari 5200 showing the stick in it's free-float mode where the center springs are disabled and the stick's position is entirely in the user's control. 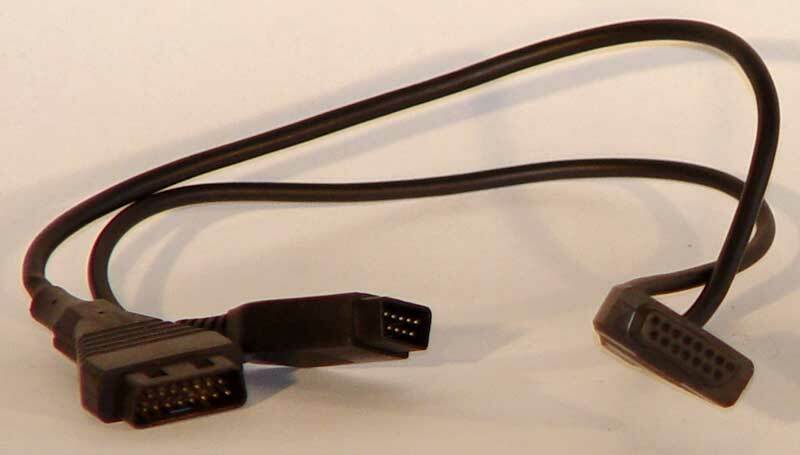 Atari 5200 Wico controller adapter cable allows the WICO and Atari joysticks to be connected to one port on the 5200 console. 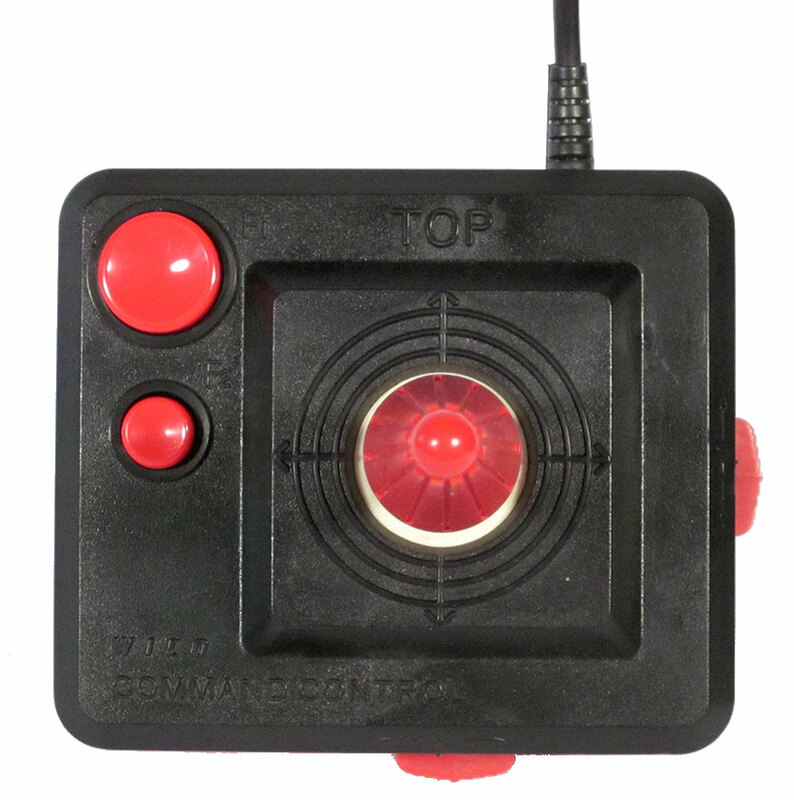 This allows players to use the numeric keypad on the Atari controller as well as the improved joystick on the WICO. 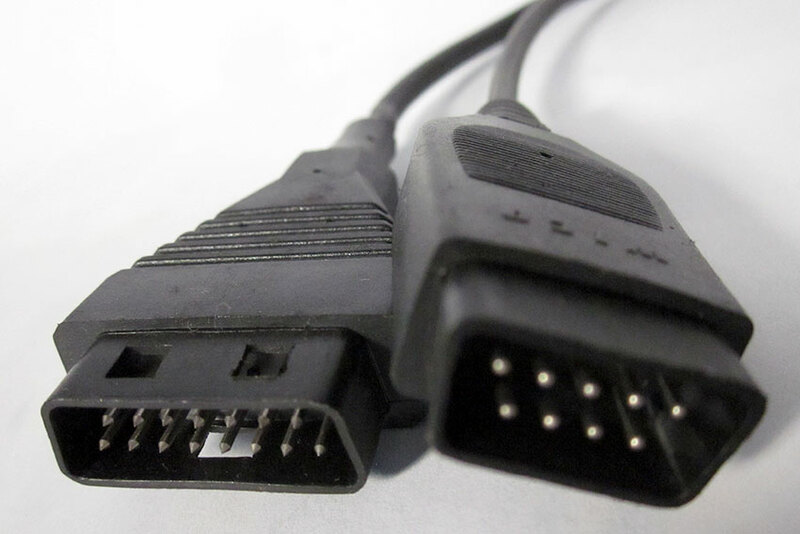 Atari 5200 Wico controller adapter cable demonstrating how it branches from the 5200 to both the Wico and Atari joysticks from a single port on the 5200 console. 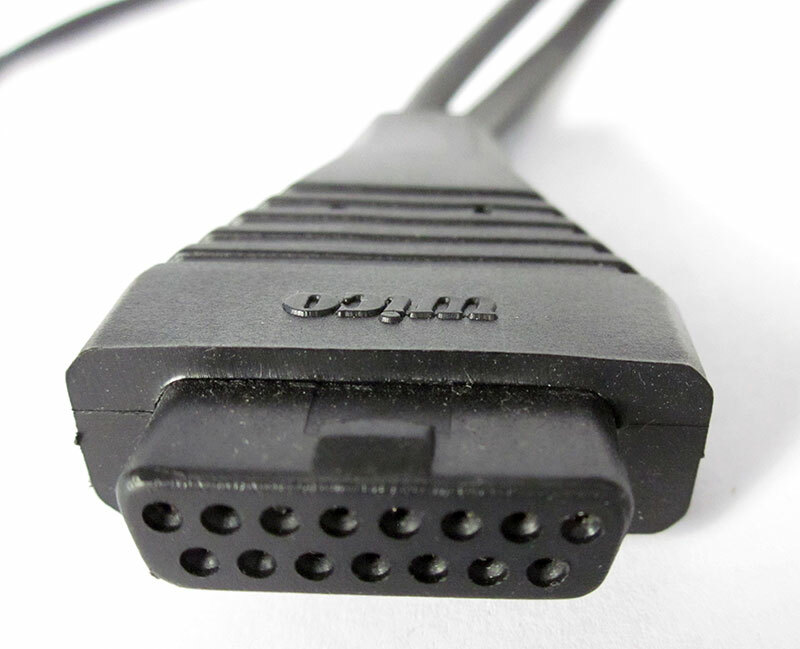 Atari 5200 Wico controller adapter cable showing connections from both the Wico and Atari joystick cables to a single connector going to the 5200 console. 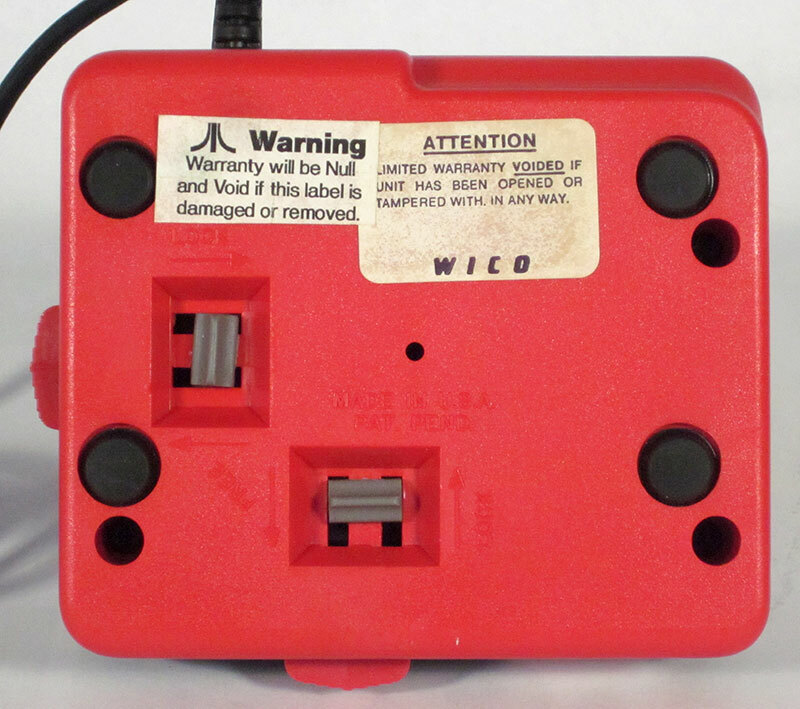 The Wico controller adapter cable ports: close up. 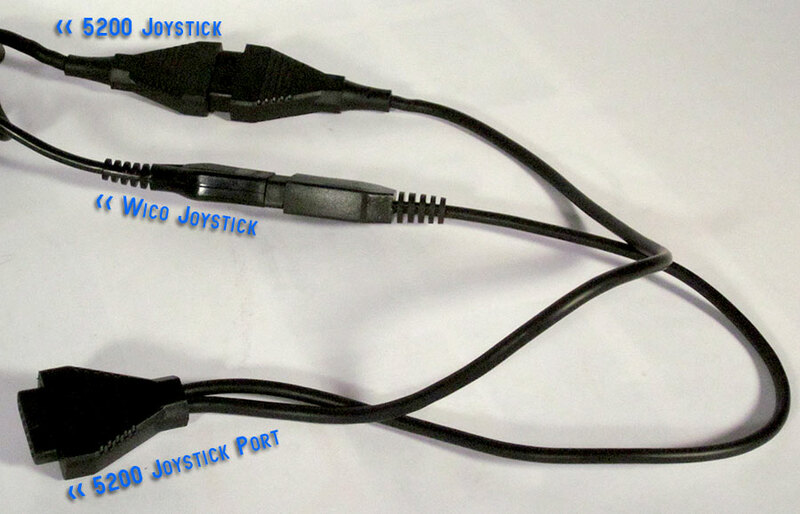 The Wico controller adapter cable showing the connection to the 5200's standard joystick port. Atari 5200 WICO controller manual. Atari 5200 joystick internal flex circuit. 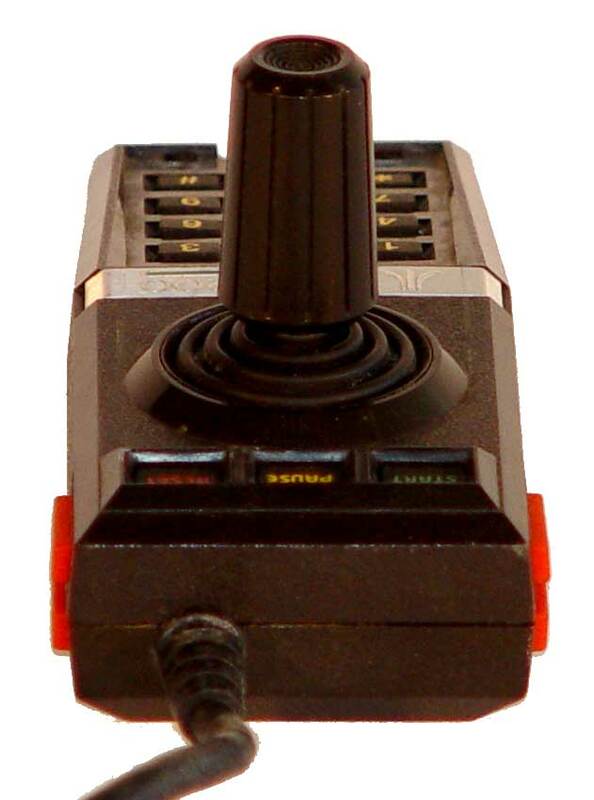 Beneath the plastic shell of the Atari 5200 joystick lies the main source of failure - the flex circuit. 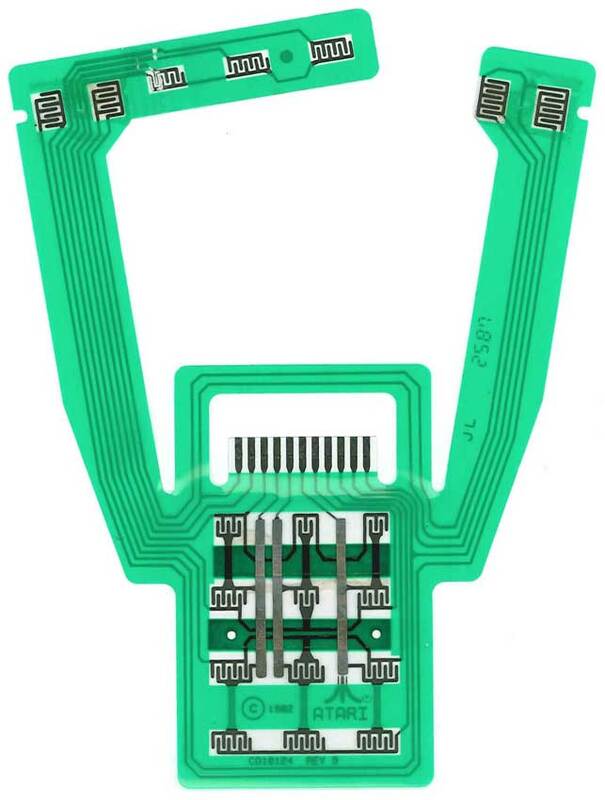 The flex circuit makes all the connections inside the 5200 controller. Here is a visual outlay of where the buttons connect when laid out flat. The box for the Atari 5200 Trak Ball controller - quarter view. 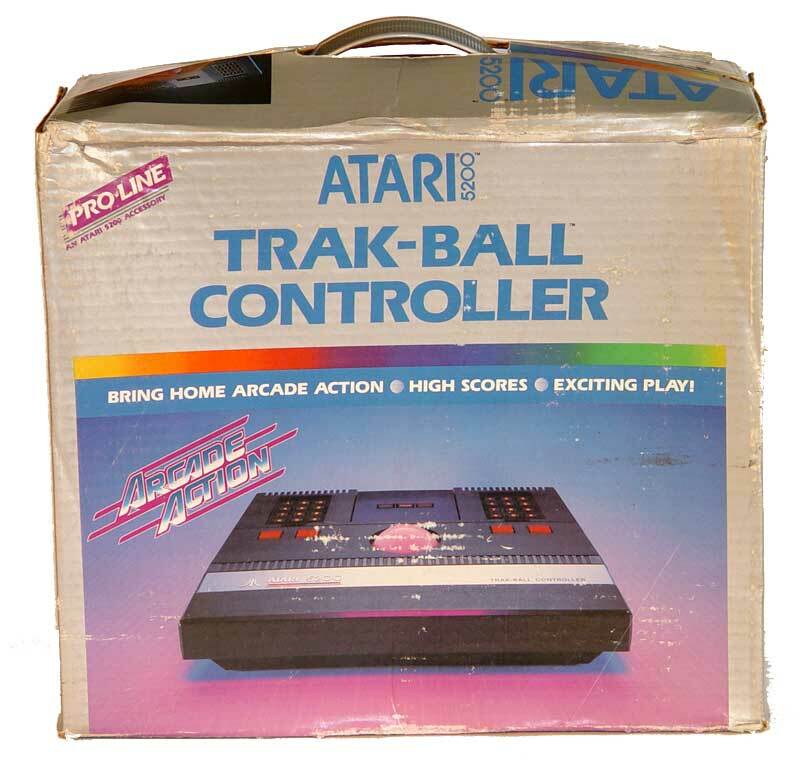 Atari released the Pro-Line Trak-Ball controller for the 5200 primarily for games like Centipede and Missile Command. 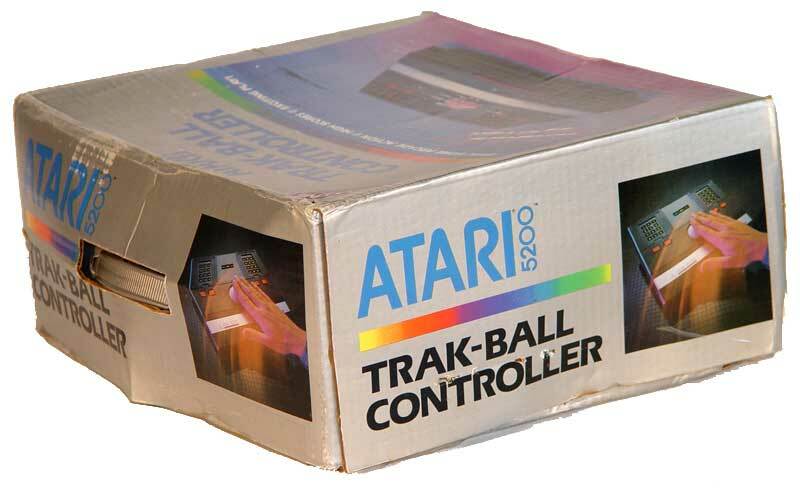 The box for the Atari 5200 Trak Ball controller - side view. 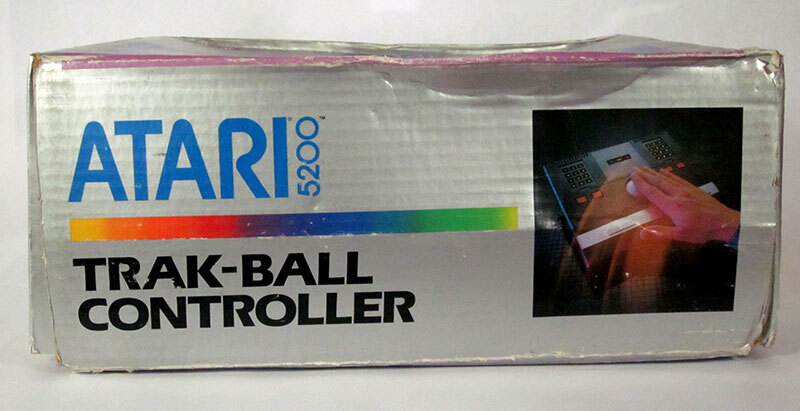 The box for the Atari 5200 Trak Ball controller - front view. The arcade version of Robotron 2084 used 2 joysticks - one for direction and one for firing. This made the game very dynamic, yet difficult to replicate for home consoles. 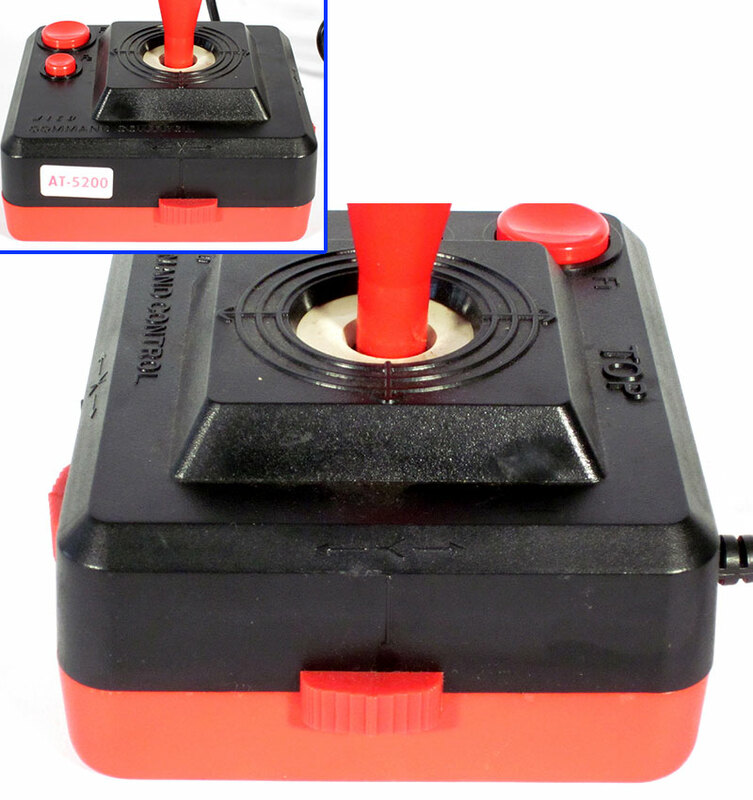 The 5200 version came with a plastic holder (conjoiner) that held both controllers together, giving you a simulated feeling of the arcade controls. Once you were done, it was very hard to get the controllers out of the conjoiner. Three-quarter view of the Robotron joystick conjoiner. This is how the 5200 controllers fit into the Robotron conjoiner. Three-quarter view of the 5200 controllers in the Robotron conjoiner. Three-quarter view of the 5200 controllers in the Robotron conjoiner from the front. 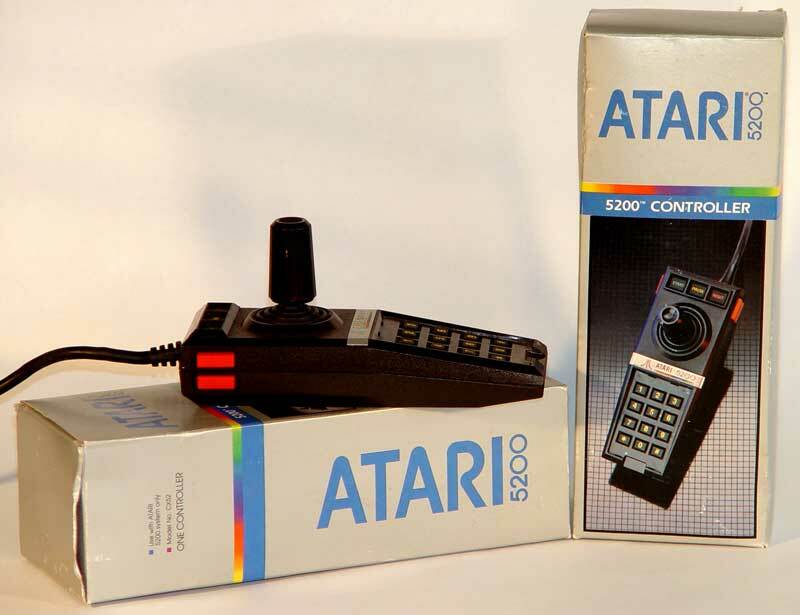 The RF box for the Atari 5200 was the first to offer auto-switching when the game system was turned on. 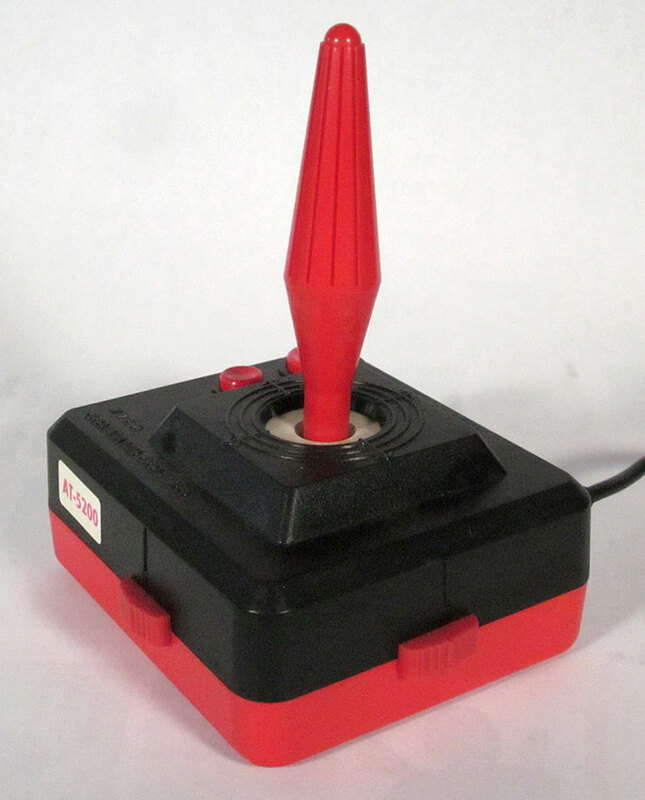 Previously you had to flip a switch to go from game to TV mode. 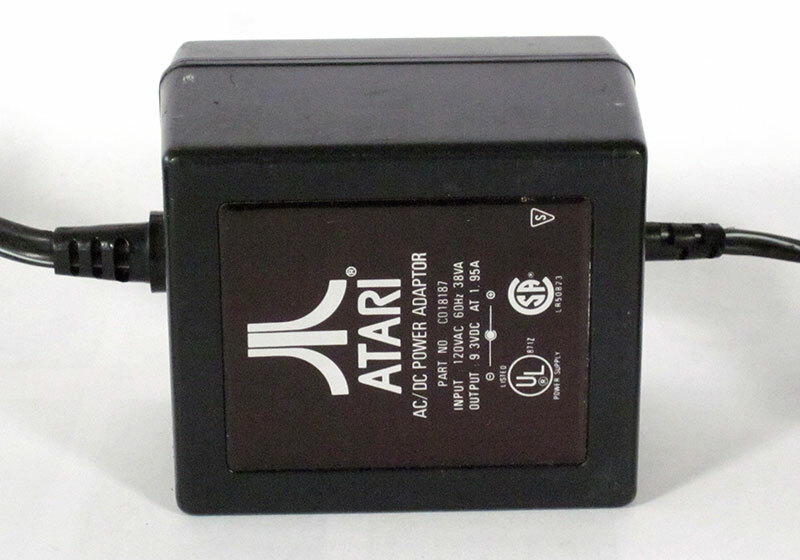 The 1983 revision of the Atari 5200 has only 2 controller ports and a change back to the more conventional separate power supply and standard non-auto-switching RF switch. 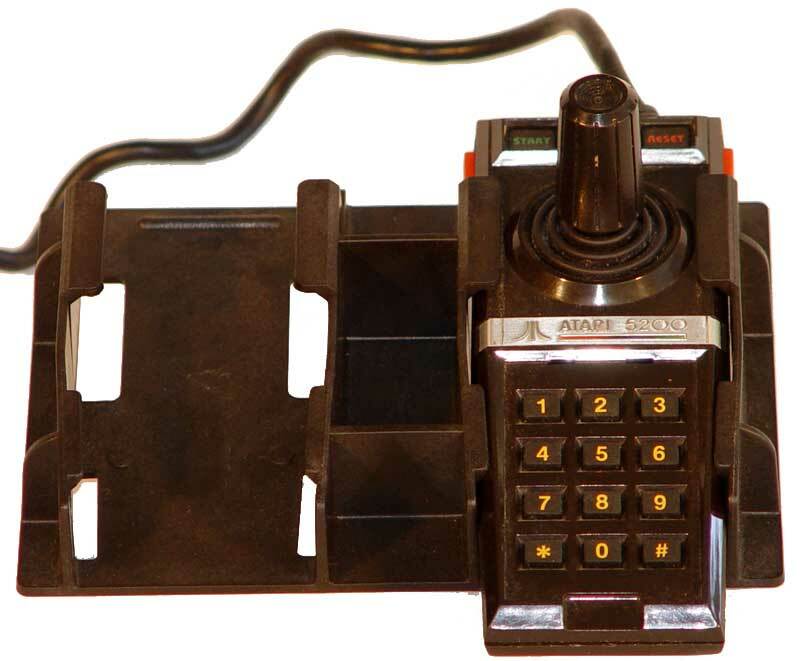 It also has changes in the cartridge port address lines to allow for the Atari 2600 adapter released that year. The RF box for the Atari 5200. 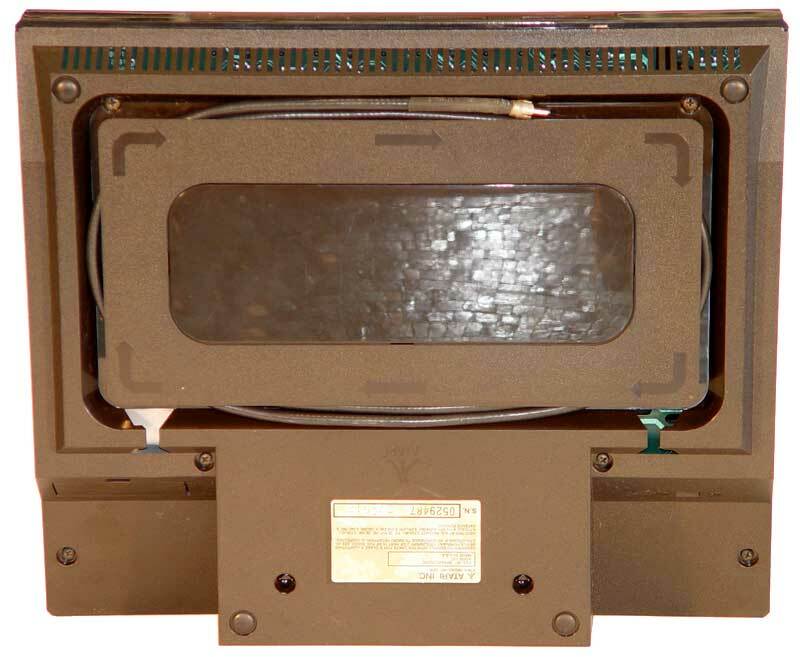 It featured the innovation of the first automatic TV switch-box, allowing it to automatically switch from regular TV viewing to the game system signal when the system was activated. This unique RF box was also where the power supply connected in a unique dual power/television signal setup similar to the RCA Studio II's. 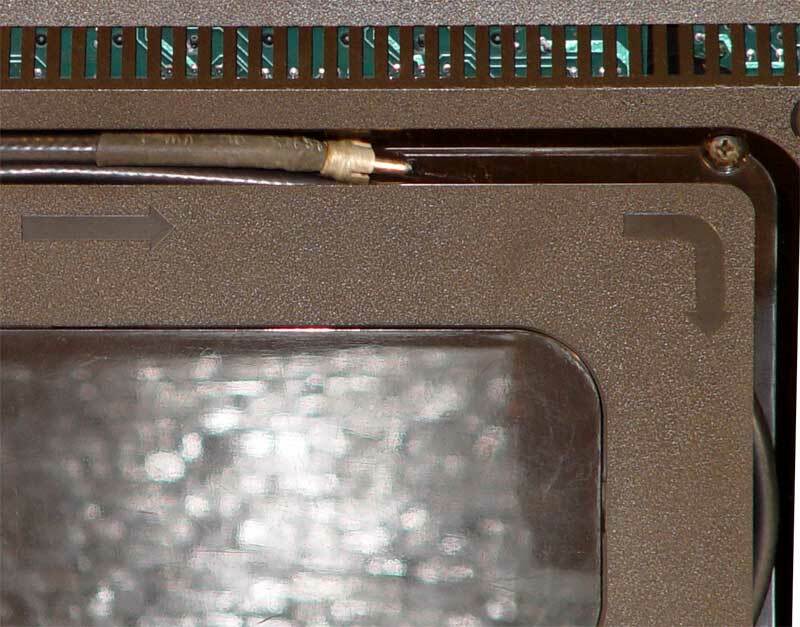 A single cable coming out of the 5200 plugged into the switch box and was used for both electricity and the television signal. 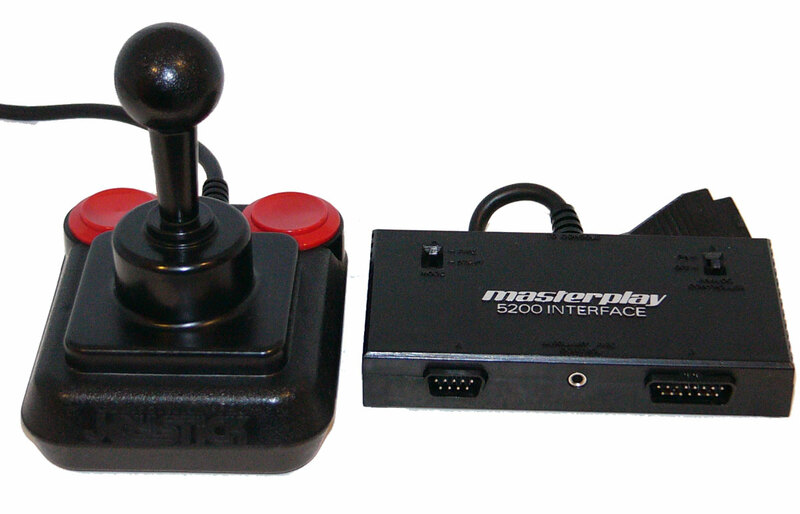 The Masterplay 5200 controller interface, from Electra Concepts, let you use atari 2600-style joysticks on the Atari 5200. 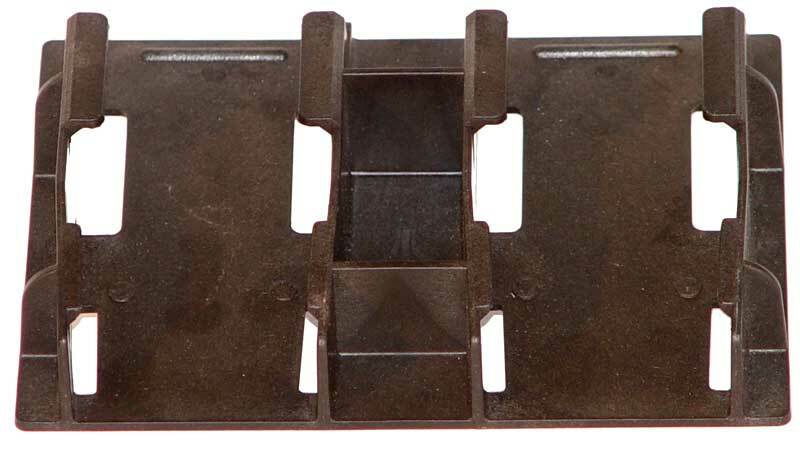 2600 cartridge adapter for the Atari 5200 box. 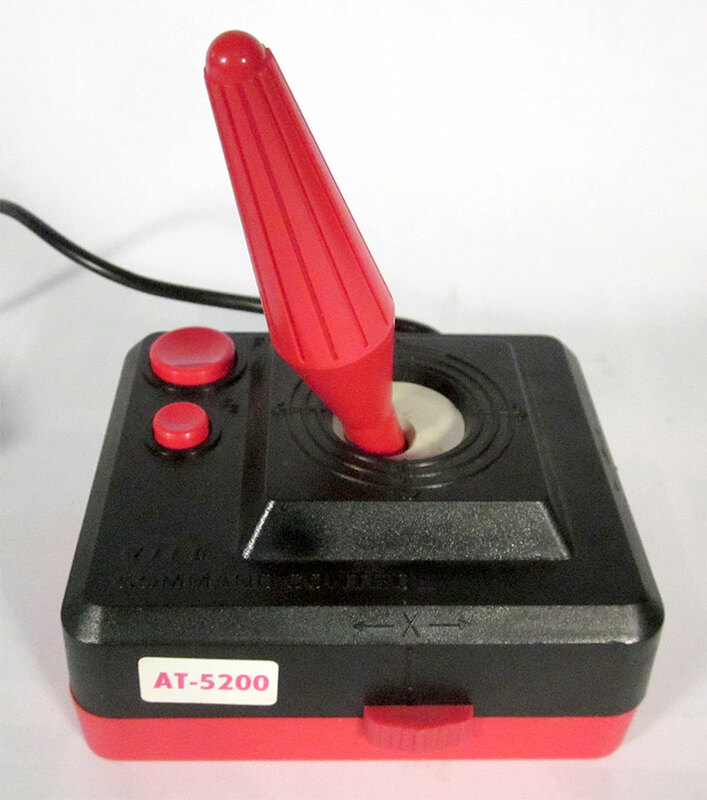 I'd love to own one of these for nostalgia's sake, but why would you want to play 2600 games on a system with such a horrible joystick? Back of the 2600 cartridge adapter for the Atari 5200 box. This 2-page ad states that Atari has put everything they've learned from creating video games into the 5200. They tout arcade-quality games although they seem not to have learned much about backwards compatibility!! What Makes the Atari 5200 Super System So Super?" (1983). 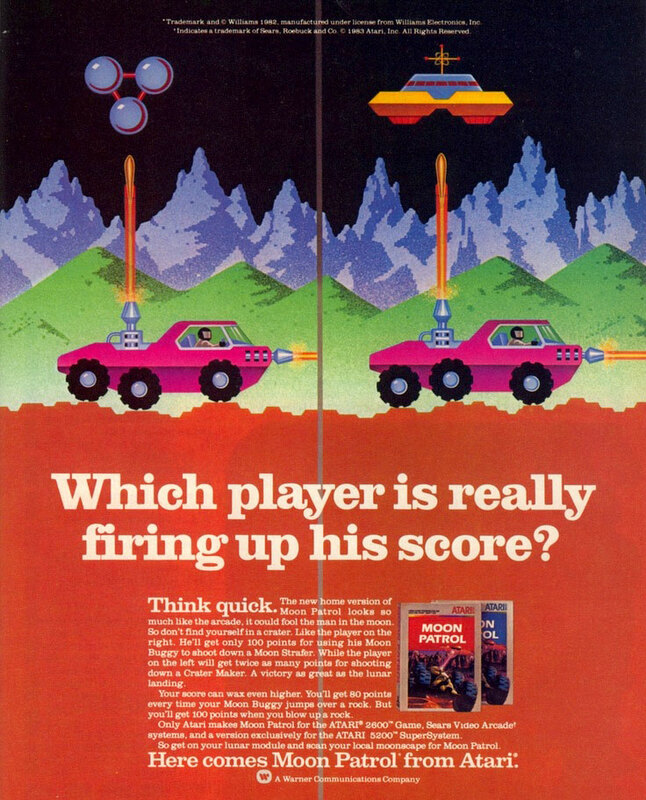 Time Warner ad for Atari 2600 and 5200 Moon Patrol was really trying to push the home versions of Moon Patrol by stating that you would get more points per action on the home version. They never made a direct reference to the arcade game, but clearly they were trying to entice sales of the home version with claims of a better gaming experience. Atari 2600 and 5200 Dig dug. "You'll dig Dig Dug." 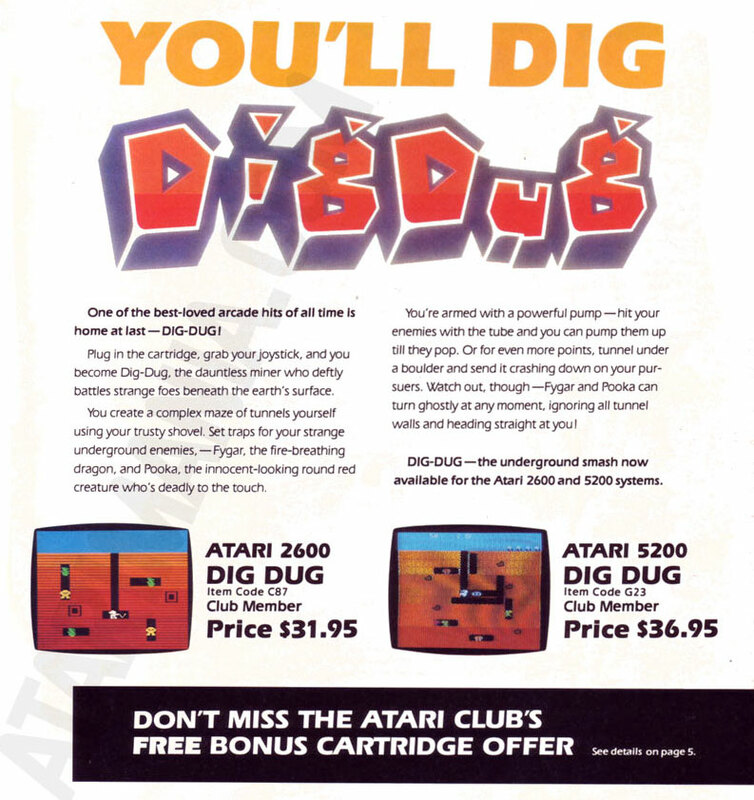 This ad also mentions a free game offer if you purchased dig Dug through the Atari Club. Intellicon ad for the Electra Concepts MasterPlay Interface for the 5200. 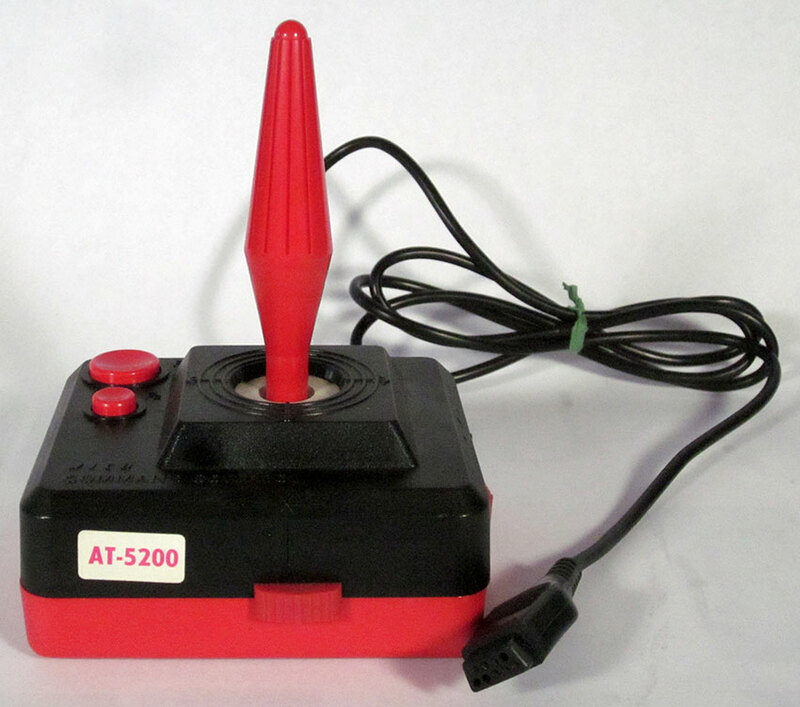 This device allowed Atari 2600 style controllers to work with the Atari 5200. The Masterplay was distributed by Intellicon after Electra Concepts went out of business.